Home » Bette Midler » Celebrity » Entertainment » Gossip » Kim Kardashian » News » People » Twitter War » Kim Kardashian VS. Bette Midler! | The Twitter War Wages On! Kim Kardashian VS. Bette Midler! | The Twitter War Wages On! 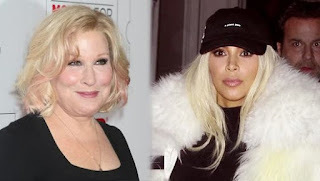 After Kim Kardashian's naked selfie caused a sea of reactions from fans and celebrities alike, Kim Kardashian and Bette Midler got into an all out war on twitter! Now the Hocus Pocus star has called out Kim Kardashian! See what she said! !